It’s here! 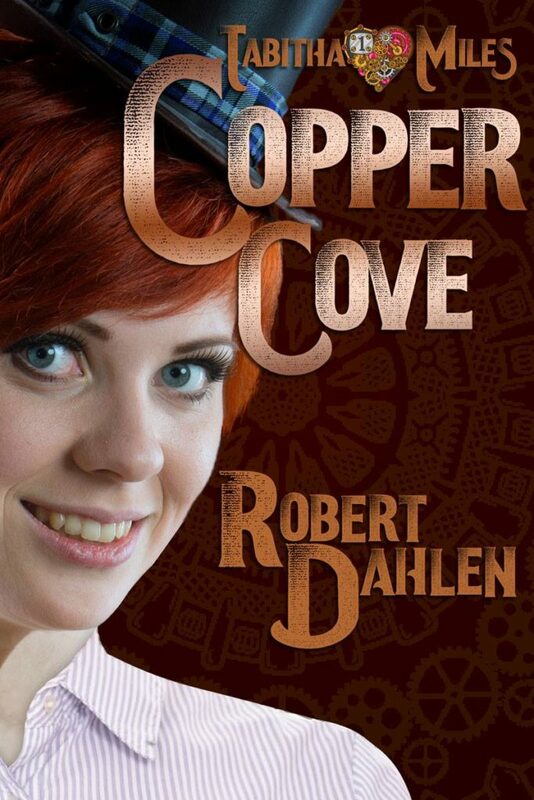 Copper Cove, my new novella, is now available on Amazon! It’s time to meet Tabitha Miles! If you haven’t read the extended preview yet, click here! There’s been a snag or two in getting Copper Cove up at other ebook sellers and in paperback, but we’re working hard on that. With any luck, we’ll have news on that soon. If you’ve already read and enjoyed Copper Cove, might I ask that you leave a review on Amazon and Goodreads? Reviews do help influence people who might be on the fence about buying an ebook, especially in a crowded market, and getting a few for Copper Cove could go a long way towards bringing in new readers. Don’t feel obligated to do so, but I’d be grateful if you did. Either way, thank you for your support! Sunday catchup is taking a week off, as I realized that is post #550 on the Monkey Queen Books blog (as counted on its original home on Blogger). I enjoy doing special things for anniversary posts, so I’m using this one to formally announce my next book, a steampunk fantasy. Coming this fall: Copper Cove! 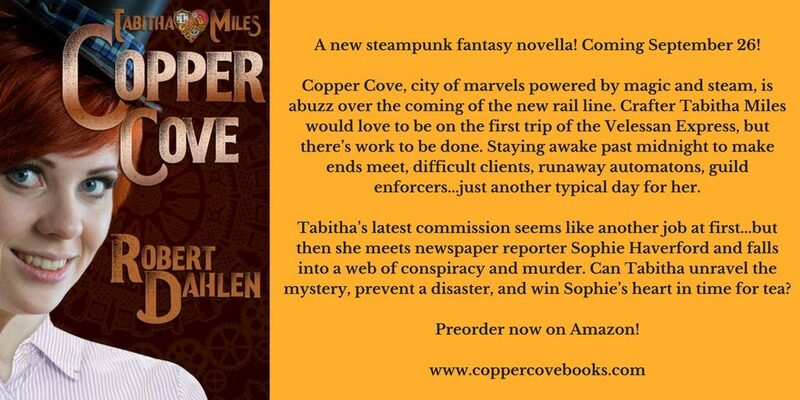 In Copper Cove, city of marvels powered by magic and steam, being a renegade crafter is no easy task. 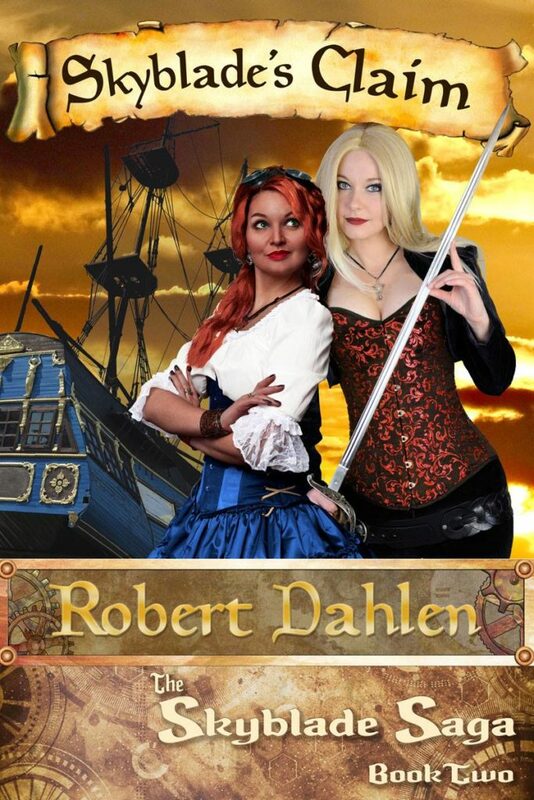 Working past midnight to make ends meet, difficult clients, tough conditions, guild enforcers…all in all, just another day for the talented, plucky Tabitha Miles. Her latest commission seems like just another job at first…but then Tabitha meets newspaper reporter Sophie Haverford and falls into a web of conspiracy and murder. 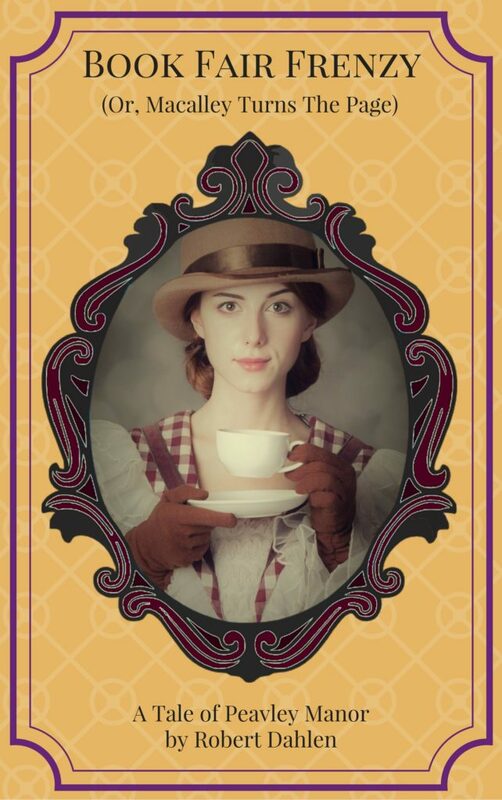 Can Tabitha unravel the mystery, prevent a disaster, and win Sophie’s heart in time for tea? I can’t give an exact publication date, as writing is still in progress, but if all works out, it’ll be out on a familiar date. It’ll be available on all my usual platforms (not just Amazon), and there will be a paperback edition. After the cut: Two brief excerpts! Today’s Sunday catchup will be brief, due to a badly-timed power outage. But I do have an announcement, for those who missed it during Friday’s Tea Party: Work is underway on the second Peavley Manor story! 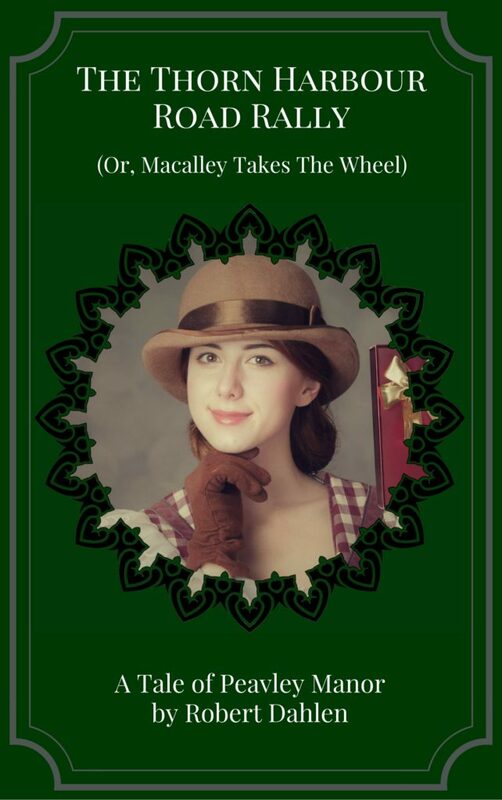 It looks like it’ll be another novelette, and the title is… “The Thorn Harbour Road Rally (Or, Macalley Takes The Wheel)”! Look for it sometime in May! And If you missed Madame Askew’s Tea Party last Friday, you can watch it on Facebook. The delightful, vivacious Madame discussed tea, dances, Scotland, a naughty cat, more tea…and “Book Fair Frenzy”! I cannot thank Madame Askew enough for her time and her kind words. Don’t forget – the good Madame and/or other members of the Temporal Entourage host a Tea Party every Friday night, so do drop by! More next Sunday as always, Assuming the lights stay on, that is. Book Fair Frenzy to be featured on Madame Askew’s FB Live on Friday! If you’ve read “Book Fair Frenzy (Or, Macalley Turns The Page)”, you’ve seen the mention in the acknowledgements of Madame Askew (a.k.a. Jocelynne Simone), whose videos on tea dueling helped to inspire parts of that story. I’m pleased to announce that Madame Askew will be discussing “Book Fair Frenzy” during the weekly Facebook Live video on her Temporal Entourage’s page! It’ll be Friday, April 21 (tomorrow! ), starting at 6:30 PM Pacific / 9:30 PM Eastern / 3:30 AM CET! If you can’t make it for the live webcast, it’ll be available for viewing shortly after the webcast wraps up; check my Twitter feed for the link, or check here on Sunday. Oh, and since Madame Askew will be discussing a story I wrote, I will be taking part in the live chat. There may be questions. There may be behind the scenes insights. There may even be a surprise. But make no mistake…there will be tea and biscuits! Click here to find out more about Madame Askew, her trusty sidekick The Grand Arbiter, the rest of the Temporal Entourage, and their many adventures, and also to be notified when the event goes live. Hope to see you there!